Nemaha County has changed over time, beginning in 1854 with the first settlement of the territory. "The Indian Country" became Forney County, Nebraska originally when the Kansas-Nebraska Bill was signed into law by President Franklin Pierce on May 30, 1854. Forney County at that point was between Camp Creek and the Little Nemaha River, running sixty miles west from the Missouri River. The county name of Forney was for John W. Forney, a member of President Pierce's cabinet. 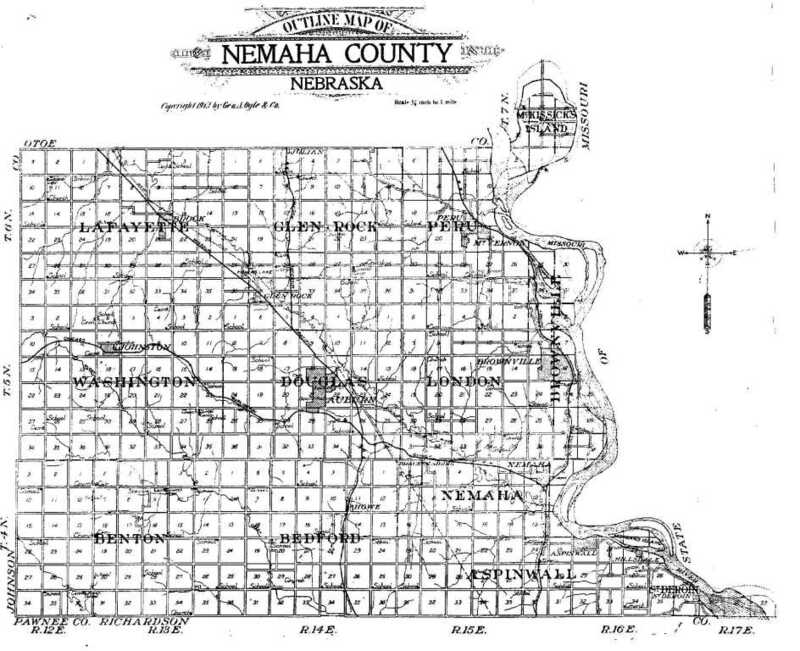 On March, 1855, the territorial legislature changed the county name to Nemaha County, and the boundaries were reset. The territorial legislature also named Brownville as the county seat, and the first - and only - precinct at the time of the first election in December 1855 was called Brownville Precinct. Over the next two years precincts were added, named Tecumseh Precinct (now Johnson County); Kennison Precinct (northern half of Nemaha County); and Mt. Vernon Precinct (now Peru Precinct). The above information was abstracted from a longer description of the origins of Nemaha County that was published in "A History of Nemaha County 1987" by the Nemaha County Book Committee and the Nemaha Valley Museum. R.W.Furnas, "Book and Job Printer" in 1859 described the origin of the county in a small booklet he prefaced as follows: "It is thought not improper to preface with a few facts connected with the first organization of the city of Brownville and of Nemaha county. They may prove interesting as references in after years, when the graves of those now earnestly engaged in laying foundations for the future, are grass grown. That portion of country now occupied as the city and county above spoken of, was inhabited as "Otoe Country." The Indian title was extinguished, and the Act organizing the Territories of Nebraska and Kansas passed by Congress in 1854." R. W. Furnas, the printer above, published a small book entitled "Nebraska. BROWNVILLE and NEMAHA COUNTY in 1859" which is available in part in the Nebraska State Historical Library in Lincoln, Nebraska. Mr. Furnas, later Governor Robert W. Furnas, donated a copy of his book to the library, and it is archived as number 6B. That book, hopefully, is behind locked doors as the shelf copy is missing a few pages. In 1859, R. W. Furnas wrote that Nemaha County "comprises Townships Four, Five and Six, and extending West from the Missouri River to the centre of Range 12, East of the Sixth Principal Meridian; containing 414 square miles, or 265,000 square acres." Note: This book has descriptions of each town which existed at that point, and a transcript is in progress for future publication in the Nemaha County NEGenWeb Project pages. The Federal Census of 1870 was recorded for Nemaha County showing these precincts: Aspinwall, Bedford, Benton, Brownville, Douglas, Glenrock, Lafayette, Nemaha, Peru, St. Deroin and Washington. A total of eleven precincts. In 1894, a plat book of Nemaha County, Nebraska was compiled by C. H. Scoville, and published by National Publishing Co. of Omaha & Philadelphia. That book lists townships rather than precincts, but they have the same effect of providing boundaries of land, whether for voting or for land descriptions. The term "precincts" is customarily used in Nemaha County, however. The townships shown were Aspinwall, Benton, Bedford, Brownville, Douglas, Glen Rock, Island, Lafayette, London, Nemaha, Peru, St. Deroin and Washington. This amounts to a total of thirteen townships. In 1913, the townships are shown as: Aspinwall, Bedford, Benton, Brownville, Douglas, Glen Rock, Lafayette, London, McKissick's Island, Nemaha, Peru, St. Deroin, and Washington. A total of thirteen townships. A map is available for viewing, published by Ogle & Co. in 1913. In a listing included in a 1980 plat map book by R. C. Booth Enterprises of Harlan, Iowa, the townships remained as they were in 1913. A recent publication, 1999 Plat Maps of Nemaha County Nebraska by R. C. Booth Enterprises of Harlan, Iowa, indicate that the township numbers have shrunk to ten. Aspinwall, London and St. Deroin have been absorbed into the others. The existing townships are shown on many modern mapbooks, and online if researchers are interested in seeing the modern boundaries. The plat map is also available for sale at the Nemaha County Courthouse in Auburn, Nebraska. Prepared February, 2000, for the Nemaha County, Nebraska NEGenWeb Project.